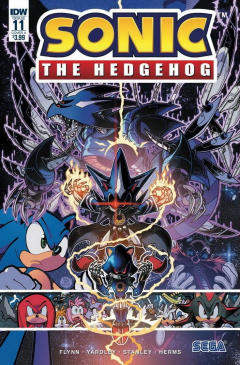 "The Battle for Angel Island Part 3"
Sonic the Hedgehog #11 is the eleventh issue in the Sonic the Hedgehog comic series published by IDW Publishing. The poses Sonic and Shadow are doing for Cover RI is similar to what they're doing in Sonic Adventure 2: Battle's intro. This page was last edited on 19 March 2019, at 13:40.